I've created a new badge for the participants of Sepia Scenes. Feel free to copy and paste it to your blog when you post for our meme. This is an old Grist Mill (c.1730) in Roslyn, New York. I love the detail of the old lock. It was built sometime before the mid-18th century and is one of the few surviving Dutch colonial commercial frame buildings in the U.S. Added to the National Register of Historic Places in 1986, it is currently being restored for use as a museum. The two-and-a-half story rectangular mill is 50½ feet (15 m) long by 25 feet (8 m) wide. The original timber framing, which uses a series of transverse post and beam bents connected by sills and wall plates, differing from the traditional European grid pattern, is now covered in weatherboard. A one-and-a-half-story wing is located to the west, above the race. A mill pond, incorporated into the Roslyn Village Historic District unlike the actual mill itself, is to the north, its outlet eventually feeding into Long Island Sound. The ground floor has, in the past, been dropped about 12 feet (4 m) below street level, due to the effect of tides and renovations on its footings. A hook-and-pulley double plank door is located in the center of the attic. Windows are irregularly located since many have been either added over time or boarded over. Some of the original milling equipment, mainly gears was still located inside as of 1986. I love old mills like this (as evidenced by my many shots of Yates Mill). Nice detail work on the working apparatus too! I'm guessing Mr. Linky is giving you the same fits he's giving everyone else, eh? These old buildings are wonderful. I especially like the closeup of the fittings. Love old shapes and textures like this! Beautiful! I came back to sepiaworld, Mary! I was gone too long. This old mill has an interesting story. It would be fun to visit when it is a museum. Thanks for sharing. I like the rose tint you have on the photo. Pretty! What a gorgeous mill! They are becoming few and far between here and not many even work as a mill any more. I liked the closeups as well. Beautiful; we leave near an old mill and this reminds me of it. Fabulous photos, Mary. I love old buildings. Mr. Linky is awol. My sepia contribution is here. Fun on the midway. I love the lock you have shown here. And the history and links to follow are right up my alley. Lots to explore today. Happy Wednesday. I love old buildings like this. Love the detail you captured in the closeup. 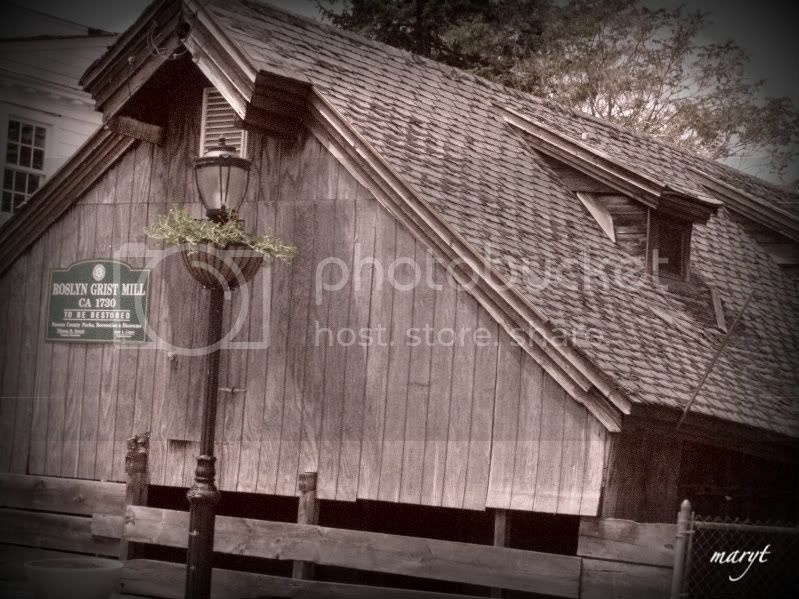 The badge that I created for Sepia Scenes is Mabry Mill, a grist mill in Virginia along the Blue Ridge Parkway. Today, I sepiazed some Wren's Nest things - the outside of my shop, the plaque on the outside of the building, and a promo giveaway bird house at It's A Blog Eat Blog World (and let me know what you think of my new template!). There's also a shot of Jazper the shop kitty inside The Wren's Nest over at Purrchance To DreamOh - I don't know if you follow Mr. Linky on Twitter or not, but Mr. Linky has advised all of us with linky html script in our blogs to temporarily remove it from our templates. So for now, we need to leave links in comments. The script for people who don't know how to leave a link in a blog comment is over at Manic Monday. Fabulous shots. I always injoy your history lessons too. We don't have mills out here in the bay, but I would love to see some. It's wonderful that this old building is being restored and not allowed to deteriorate. And to transform it into a museum is perfect. I love the little bits of green in the first picture. What a wonderful old building and perfect for sepia. 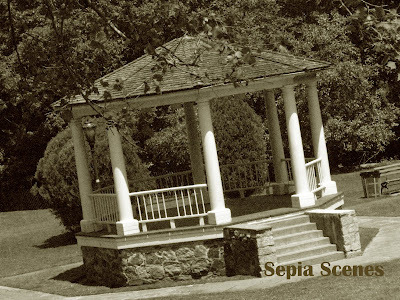 Very beautiful sepia photo, Mary! I wish I could figure out how to post bigger pictures!! This is mine for the week! The old mills fit the sepia tone very well. Perfect for Sepia, I just love old mills! These are great pictures. I love the way old wood looks. is Mr. Linky feeling poorly today? Great photos! They look really great in sepia. You can see my sepia post at my place, Sherrie's Stuff. http://sherrie-plummer.blogspot.com/2009/05/sepia-scenes-and-window-views.html Have a great day!! Living in Florida where many buildings last about 20 years and then are torn down, I have a great affection for these older structures. I love your sepia blog, too...sepia can be so effective for shots like these! Thanks for your many kind comments on our blogs, Mary! 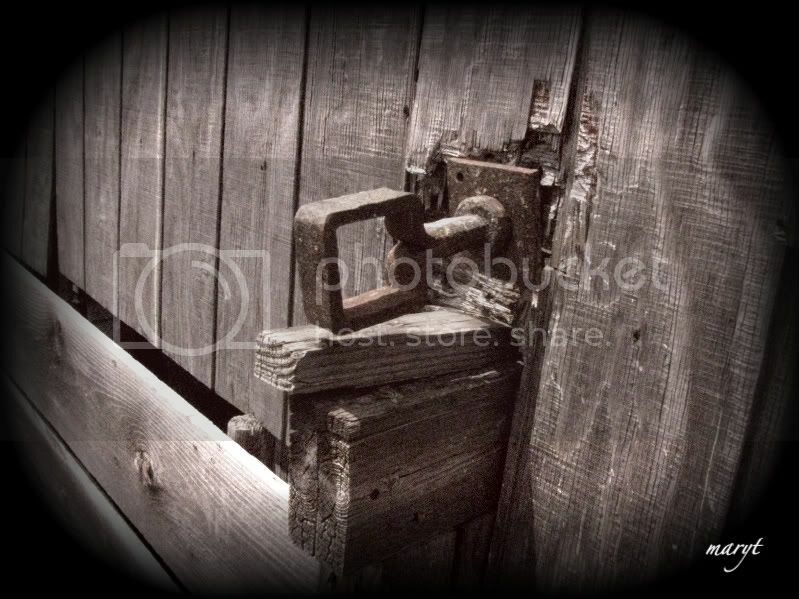 I also love the details of the old lock, Teacher Mary.